Have you ever wished there was an easy way to enhance the color of your hair everyday? Something that didn’t involved leaving on hair dye or tint for hours? What if I told you that I have found a solution with an herbal color enhancing hair spray? I’ve been making my own hair spray for years now. I ditched the commercial chemical laden hair sprays a long time ago. I wanted something healthier for my hair. That recipe on its own is great. 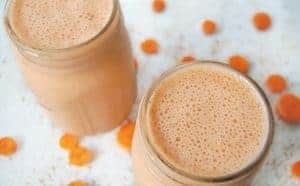 It works just as well as the store bought stuff, costs pennies to make, and it doesn’t have any crazy ingredients! I had heard about using herbs or teas to dye your hair and so I decided to combine the idea of herb dying with hair spray. It’s a great idea! 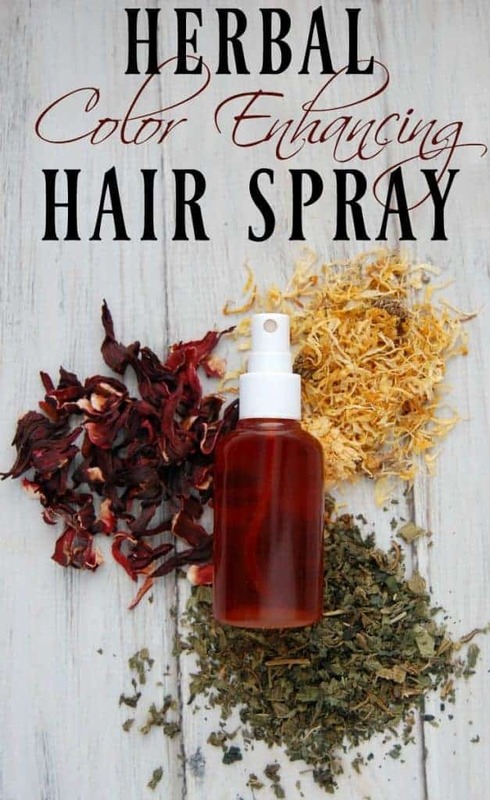 I use hair spray almost every day on my hair and with the help of the herbs, I can give my hair a slow and subtle boost in color. Now this is only going to enhance your hair color. It won’t drastically change your hair color. It also won’t instantly change your hair color. It’s a slow enhancement. I think it was 2-4 weeks before I really noticed that my hair was a different color. Nonetheless, this is a great way to slowly tweak your hair color or to help maintain a hair dye. Not sure you want to go out and buy a bunch of herbs? That’s ok! 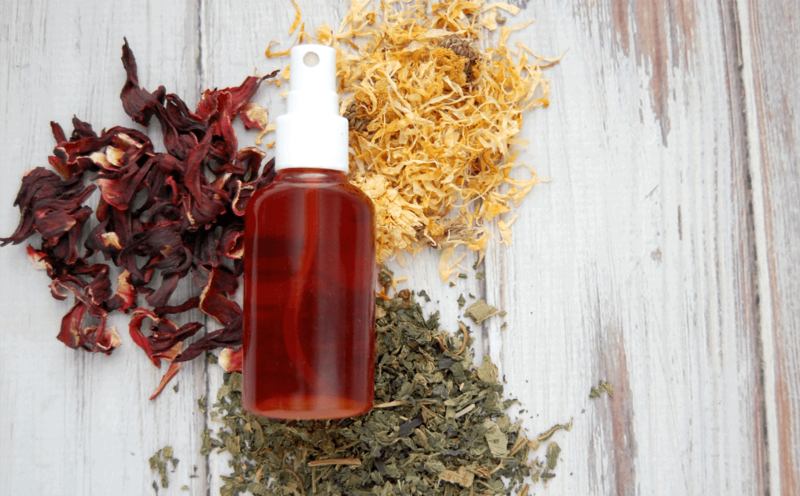 This herbal color enhancing hair spray can also be made with tea bags!!! If you want an extra way to enhance your hair color, then make sure to swap out your conditioner for one of my herbal vinegar hair rinses! Heat water to boiling. Add herbs or tea bag and steep at least 15 minutes. Remove herbs/tea bag and mix sugar into the still hot tea. Stir till fully dissolved. Once the liquid has cooled, pour into a spray bottle. This hair spray works great. If for some reasons you feel like you need a stronger hold, simply increase the amount of sugar. If you need less hold, then decrease the sugar. One warning, this is essentially sugar water. While I’ve never had an issue with bees (and I’ve walked right through a buzzing field with this stuff on my hair before!) those with severe bee allergies may want to err on the side of caution. what if i just want to use it as a hair dye, leave out the sugar? If you wanted to just use it as a hair dye then yes, leave out the sugar. Spray on your hair and let dry. Keep in mind that this isn’t a strong dye. Even if you coated your hair in a strong brew of the tea and left it one for an hour or so, it still will not likely drastically change your hair color. This is a very gradual, over time type thing. 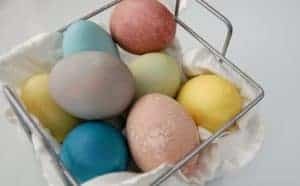 Hi Brittany, I love your great, simple to do ideas! 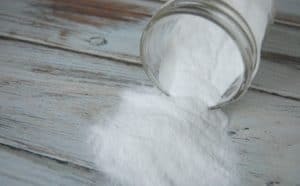 I have a question…would salt work as well as sugar? No salt would not work as well. Sugar helps give the hold….salt would do the whole beachy waves thing. Salt also attracts moisture, so if you have trouble with humidity affecting your hair, salt would make it worse. haha… well I do have a few grays but they aren’t strong enough in number yet. 😉 This hair spray on it’s own will likely do very little for grays. I have read that adding sage will allow grays to better absorb colors so if you do try this, I’d recommend steeping sage in with the tea. As for the yellowing issue… hmmm no I can’t think of anything that would help with that. There are lots of natural dyes out there (like black walnut, coffee, etc) but I don’t think they help with brassiness. Sorry. Hello I can help you with the yellowing of your hair. The reasoning for the yellow is usually 2 things. One being a smoker and 2 it could be your water. So it needs to be removed. To do this wash your hair with a clarifying shampoo (it won’t go away in one shampoo. Every time you wash your hair use this until you see it’s gone) and fallow with a good conditioner because it will dry your hair. Than you can use this lovely woman’s hair spray. PS I love the idea!